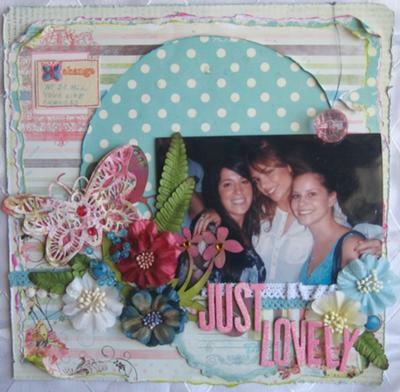 This is a very new page made with my DD 3-4 years old photo from some celebration, and her 2 best friends are there too. I made it Prima oriented as I love this company a lot. All page is distressed and inked. The bare branch chipboard is covered with 4-5 tones of inks, I also made a home die cut butterfly and beaded branch.The brown chipboard was covered with small Cat's Eyes inks " directly to the chip" and them heat embossed with a Clear Embossing powder for the shine. And my frugal tips: I didn't actually used the middle paper, but a cut thin frame of it- and kept the inside piece for the next projects. 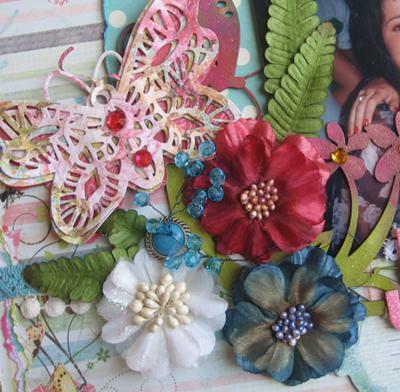 Also you don't need to buy the pre- made expensive beaded on wire embellishments- you can made your own with some old beads and a piece of wire as I did on this page.